Tantallon – a ring of truth? From the description of its size and style of engraving, you might assume that the ring once belonged to a lady, or perhaps a lady in waiting: lilies, the Virgin Mary, the Angel of the Annunciation… purity, chastity, virtue. The initials ‘I.R.’ might well be the initials of the owner. (You can see drawings of the ring by clicking on the links above and below). In this second opinion, the flowers are not lilies but forget-me-nots, and from the drawing this seems more likely. It looks to me as if the female figure may be holding a baby, but it is really too small to see. Somehow, there is a little bit more intrigue attached to this description, and a suspicion of romance. 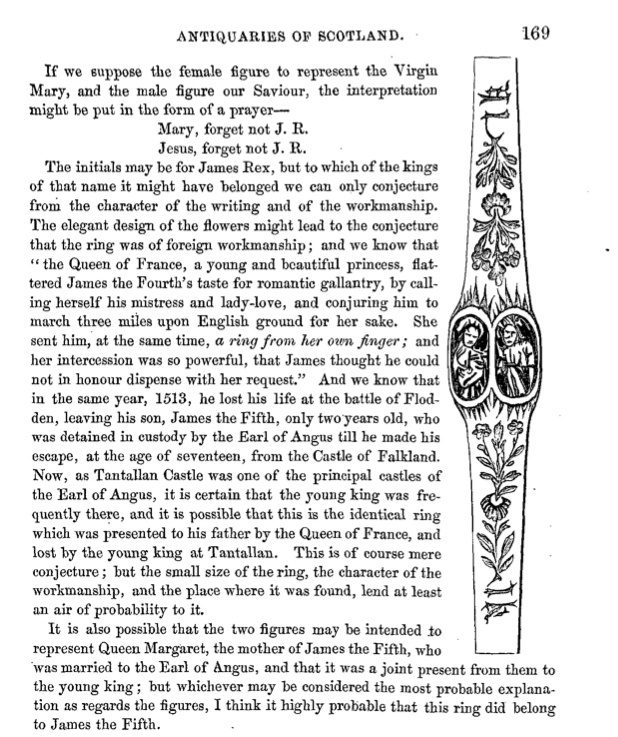 When the ring was exhibited to the Society of Antiquaries of Scotland, it was suggested that it may have been given to James IV, who had apparently caught the eye of the Queen of France, “a young and beautiful princess”, who called herself “his mistress and lady-love” and sent him a ring from her own finger, daring him to “march three miles upon English ground for her sake.” I am a bit blurry about the French queens. Would this have been Anne of Brittany? The writer also wondered if it was a gift to the young James V from his parents. When I wrote about Tantallon, I was prepared for a history of war and power, siege and bombardment. These are men’s stories, while the women got on with the duties of marriage and childbirth. This lovely little ring could tell a different story. The ring is currently in the collection of the National Museums of Scotland, along with other finds from Tantallon. Tantallon a much overlooked castle which is a shame as it position and style is so grand. It is on my list to revisit as the only images I have are transparencies from the pre digital era. Maybe this year. I will….but from memory I seem to recall that the distant views placing the castle in its dramatic location were rather difficult to get to just the right place. But the view from the battlements over to Bass Rock are worth the visit just for that. It is a case of trial and error, and going when the tide is out! 🙂 And yes, the view from the top is absolutely stunning. Fascinating. It’s good that there’s a little mystery surrounding the ring – more romantic! Knox says James V went to visit his mistress the earl of Crawford’s daughter before his death – but that would be Fife?? He did run about the country after Solway Moss. Loves these mysteries! I know, Marie, I think it’s fascinating too! I wouldn’t mind having a look at that little ring at first hand. It does make me wonder what lies beneath the soil around places like Tantallon. Thank you for shedding some light on the Queens of France, and also on one of James V’s mistresses. Perhaps he popped across the water to Tantallon?! I guess we’ll never know! What a neat mystery…and how amazing a surveyor would just stumble upon it, so many years lost? Boy oh boy, Hank would love to find such lovelies on his various rambles! I’m with you on that one, Hank! 🙂 It makes me want a metal detector!